A few weeks ago I received the Holy Grail of postcards—an honest-to-goodness, authentic, 1912 picture postcard of Chattanooga, Ohio. Mary Anne Bollenbacher gave me the postcard a few minutes before the beginning of our church service and I was so excited I had a little trouble concentrating on my music. 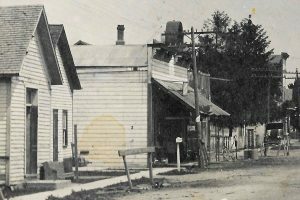 I knew there were probably some old picture postcards of Chatt out there but I thought I would never have one. I have seen this photo before. Many of you may have seen it, too, if you have ever been in the Chatt Bar. A larger copy of the photo hangs on the wall there. 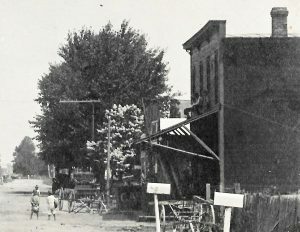 Downtown Chatt in 1912. 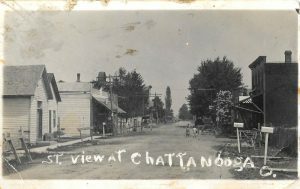 1912 picture postcard of Chattanooga, Ohio. This particular postcard comes from Olen Bollenbacher’s family, Olen being Mary Anne’s husband. The message on this postcard was written by Olen’s grandmother, Emma (Bollenbacher) Bollenbacher, the daughter of Jacob and Caroline (Schaadt) Bollenbacher, who was eventually married to John Martin Bollenbacher. 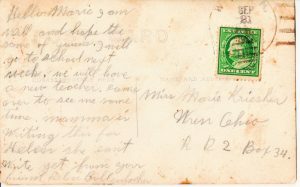 Emma wrote the message on the postcard for her daughter Helen because Helen was only 6 years old at the time and could not write. The postcard was in the possession of Olen’s cousin, who was downsizing and wanted to give the card to someone who would appreciate it. Thank you, Mary Anne, for thinking of me! I really do appreciate and treasure it. Message written by Emma Bollenbacher for her 6-year old daughter Helen. Youins. It must be a Chatt-area thing. My dad used that word quite often in his letters during the war. School must have started late back then. They probably had to get most of the farm and field work finished before they started school. The photo was taken looking to the north. On the left, beyond the first two buildings, was the Chattanooga Hotel and saloon, comprised of three buildings, where the Chatt Bar is today. You can see that the roof had a high arched section. The long sign by the water pump, in front of the hotel area, says gasoline. 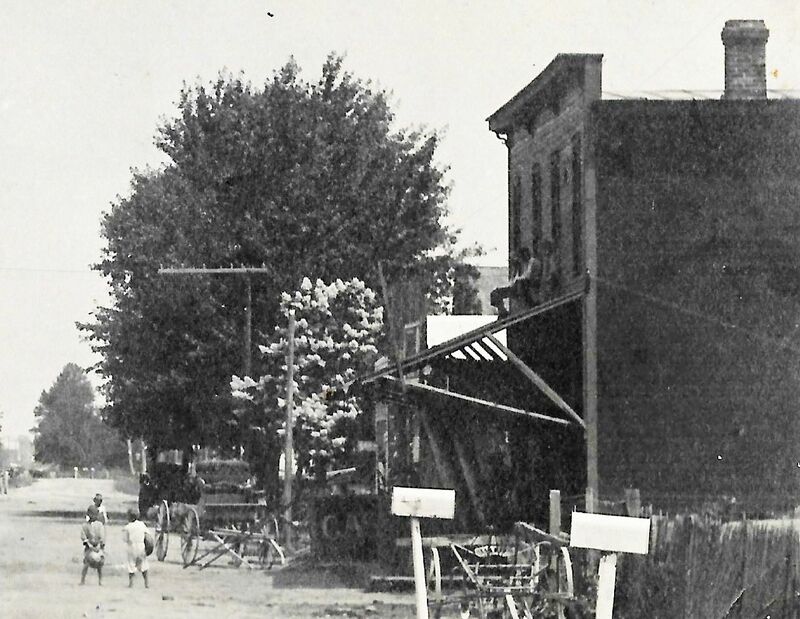 There are several buggies along the street as well as some hitching posts. There are several telephone poles along the street and another tall building a little farther north. Across the street, on the east side, is a rather large brick-looking building and one or two people are sitting on the second story roof of that building. It almost looks like someone is lying in that overhang area, too. Under the overhang is a big tank labeled GAS. The piece of machinery in the lower right has a metal tractor seat. It looks like there may be a truck farther on north, beyond the open buggy. Three young boys are standing in the dirt street and it looks like they might be playing a game. 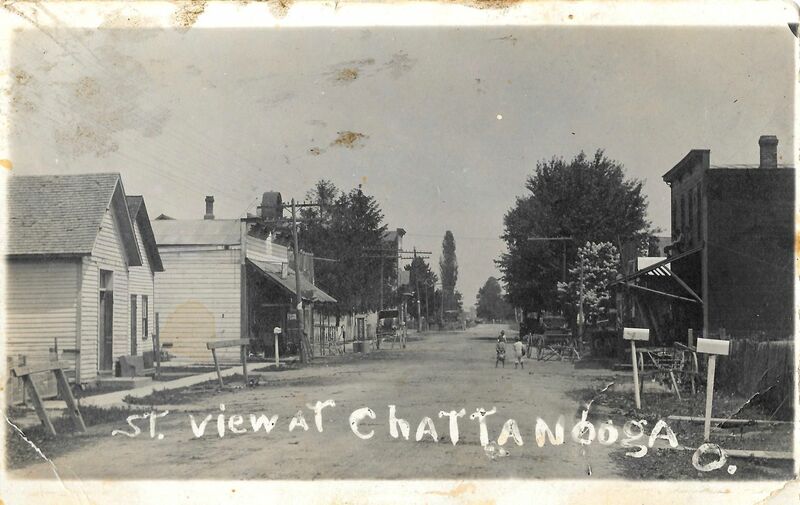 What a wonderful old photo postcard of Chatt. I feel very fortunate to have it and so appreciate that the Bollenbacher family entrusted it to me for safekeeping. Thank you! Thank you! Love it! Thanks to Mary Ann and Olen. Please tell her “hi” from Sharon Schaadt Cowen (Herb and Edie’s daughter). Of all things, we ran into them on a trip we made to Hawaii for our 25th wedding anniversary over 20 years ago! I will sure do that, Sharon! Isn’t it funny how often you run into someone you know wherever you travel? Thanks for writing. Yes Sharon Cowen, how well I remember that encounter at Hawaii. I had just been called up on stage the night before and made a fool of myself, thinking there was no one who would ever see me that I knew. There YOU were the next day standing in line waiting to see the Pearl Harbor displays!! Gosh, that sure doesn’t seem like that many years ago!!! That is a funny story about your Hawaii trip and seeing Sharon! Thanks for the wonderful postcard!